Mr Airplane Man (Tara McManus and Margaret Garrett) first met Pat Bourbonnais (Demons Claws, Gravel Route) a long time ago as he invited the band to come play up in Montreal in the 00s. They immediately loved each other bands and became friends. Around 2016, when Mr Airplane Man started to play again after a few years break, Pat invited the band to play with his new project Gravel Route. They soon made plans to come back and record a split single in Pats basement. Mr Airplane Man went to Montreal a year later with no plans and zero idea of what they would record. 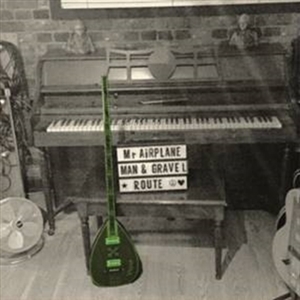 The initial split single soon turned into a full length record with collaboration on every song: Mr Airplane Man backed Gravel Route on their songs, Gravel Route backed Mr Airplane Man on theirs, and they chose two songs to cover together. Pats psychedelic country and Rembetika influences are there along with the raw garage blues and just kind of innocent folk rock moments. "Give to the Sun" isnt a split record, it becomes a fully collaboration between Gravel Route and Mr Airplane Man, a Gravel Man record!